That is the sound our boat makes when it crests a wave but doesn’t clear the valley to the next one, dropping hard into the valley. A gentle floating sensation is the only warning before an abrupt, hard landing. It’s been like this for the past forty-five minutes, and I’m worried. There was rain before I arrived, pushing the plankton down. 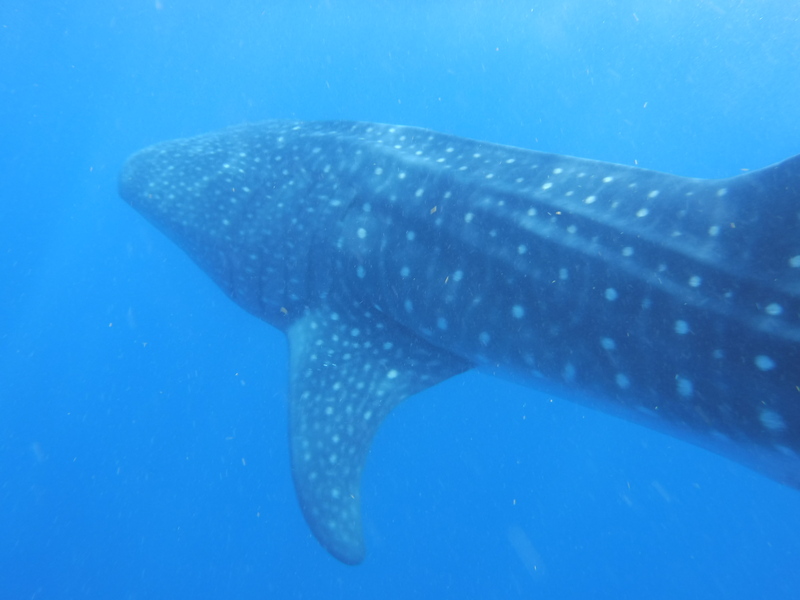 The whale sharks followed, and there was some concern that they would not be resurfacing for a couple of days. In fact, sightings had been down compared to last year overall, to the point that a couple of sightseeing groups had removed their guarantees. All this ran through my head as we sped out at 7am from the Bay of Cancun north along the island, then east out into the Caribbean Sea. We stopped to see turtles mating – awkward but also cool – but mostly it was fast travel over gentle swells. Flying fish dart out around us, gliding over waves for long stretches before disappearing into the blue. They are far more graceful than we are. Enrique and Jesus stop every so often to listen to their radios. That’s the level of sophistication. There’s a general area where the sharks go, and then the fishermen report what they see when they go out, and the tour boats follow suit. I’m nervous, but only generally so. I’ve planned this trip pretty well. I put the whale shark tour first thing, in case we don’t see any. That way I can plan a second outing. When attempting to complete a bucket list item, it’s probably best to have a contingency plan or two. WHAM! My lower back snaps at me for incorrect timing as the boat makes a sudden turn eastward and the rolling gets stronger. Our whole party grew silent about forty minutes into the trip. The young diver and I shared our favorite dive sites and stories. We politely listened to the husband describe the YouTube videos he found particularly funny, as his wife tried to gently silence him. We joked about Enrique riding the prow like a cowboy, holding the line for balance as he scanned the horizon. Now we are all slightly nervous. Isla Mujeres is no longer visible, and neither is the mainland. It occurs to me that I will get sunburn. I’m only halfway in my wetsuit, and we aren’t allowed to wear sunscreen – it disrupts the plankton. So it is with a mind full of minor worries that Jesus gives a call and points to a growing speck – two boats growing fast. Enrique motions to don our wetsuits. I pull mine on, and my excitement fizzles around me. I feel lighter, buoyant. I haven’t felt giddy in a good long time. When the others see the sharks before me (something about which I am still dubious), I all but walk out onto the water to look. I can see why joy is dangerous. I have to mentally force myself to be mindful of the space, lest I tumble over my or one of the other swimmers bags. The whale sharks are skimming the surface of the sea in slow motion. Giant dorsal fins swish back and forth, ineffectual in the air. Unlike whales or dolphins, their heads don’t break the water to breathe (they’re fish, not mammals). I am bouncing up and down inside – and probably outside too. I dash from one part of the boat to another. My travelling companions laugh at my childishness. As we drift closer, Enrique announces for the first group to get ready. I start strapping on my fins. At the same moment, my “buddy” falls backwards into the water and starts off. Now, normally this is not what you do. If you have a buddy – diving, snorkeling, etc. – you both go in together, or at least in quick succession. He wanted “unobstructed” photos of the sharks. This meant he did not need my fat, bright whiteness messing up his frames. Enrique clicks his teeth in disapproval. It’s not good etiquette, and it means I must rush to catch up. And I go, and nearly land on top of a whale shark swimming towards the boat. I don’t have time to get my camera out for an epic close up. I don’t have time to process what is happening. I have time to twist and kick. My only thought is to not bother the shark. This did not come from a place of fear, but of conservation. Whale sharks are gentle, and the idea of colliding with one violated all my naturalist principles. I guess I should have been more worried about the shark hitting me. Liz recognizes this before I do. “Honey, look out for that tail! It’s right by you!” I get the impression of a giant tail swinging towards me – four feet of unconcerned fish tail. I give a second kick, and my ocean fins (which I’ve had for a very long time), do their job and give me distance. The shark had simply adjusted its trajectory so it was nowhere near the boat, which was already gentle moving away. I will not lie. This is not how I pictured my transcendental moment. I had an idea in my head of a gentle entry into the water, and this giant creature swimming near me. I would have my camera ready, just in case, but I would be in so much awe that the world would stop for a moment of pure peace. I’d float in the sea and be transported. The panic, the rush, the confusion, the lack of camera, the shouting – not exactly transcendence. In times like these it is best to take a deep breath and refocus. I do so, blowing out saltwater through my snorkel. I’m a swimmer. I’m a diver. This is my bucket list. I am not going to let this be anything other than what I want it to be. 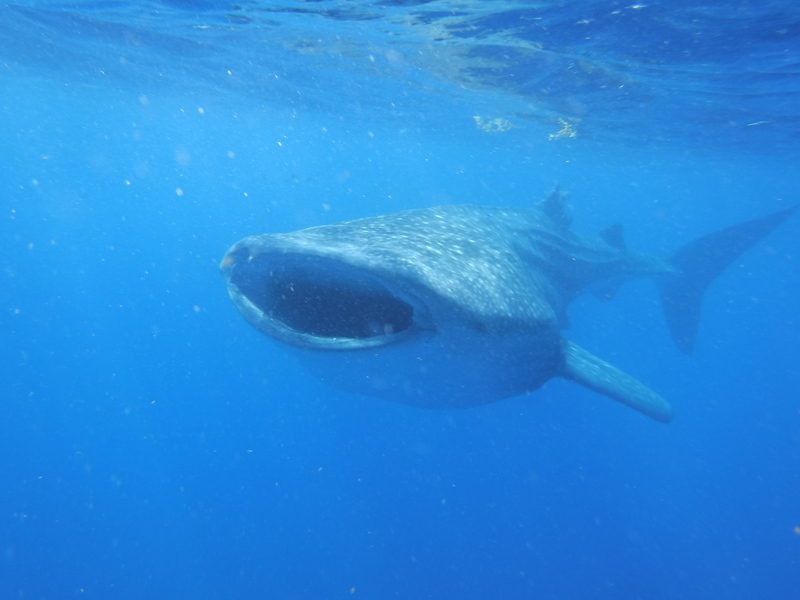 I put my face in the water and swim with the whale sharks. Let me tell you, it was beautiful. Imagine a creature thirty feet long ambling by, mouth open for tiny sea creatures. They are beautiful school busses, dappled in white spots. They move with the ease of all fish, something we will never achieve no matter how much we practice. But they’re so big, the ease is almost disconcerting. Forty feet moving quickly next to you. They are faster than I thought. I have to concede in the first go around that trying to catch a whale shark is futile. They’re not only faster, but they can dive down into the blue depths and disappear. In the second and third entries, Enrique offers to pull me along. He’s a very strong swimmer, and he wants us to get our money’s worth. I refuse at first – I’m a decent swimmer and don’t need to get right up on the sharks. But then I think it might be considered rude not to accept, so I finally accept. He is a stronger swimmer than I am, after all. And he does pull me up right along the head of a giant shark so I can take photos. The transcendence, if I want to be precise, comes in small bouts. 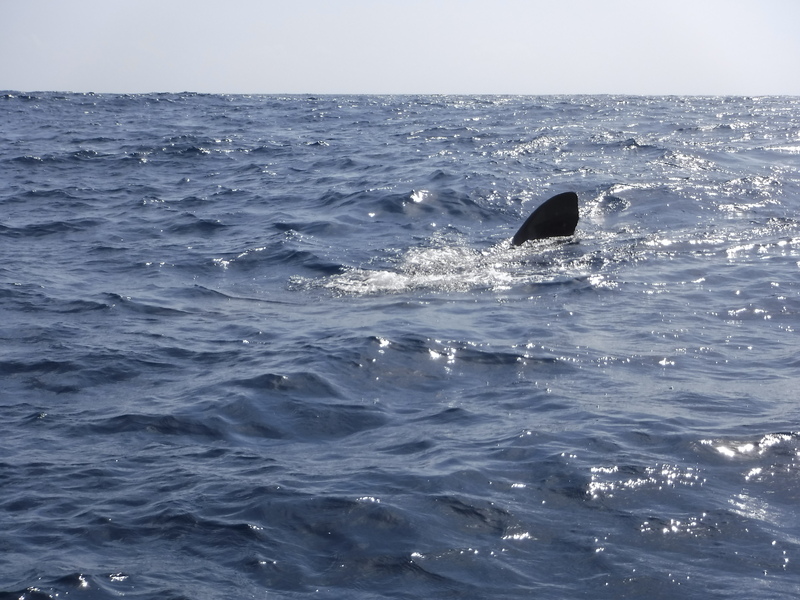 A brief moment where I’m not being directed to go somewhere or look at something I’m not seeing – a minute where, in the deep blue water, I can see the outline of a great whale shark swimming lazily just inside my field of vision. That’s what it looks like – they look like visions when they’re at a distance. I don’t have to be two feet from one to appreciate it. I’m happy in the silence of my own breathing and the presence of so large a creature. And there’s the pleasant unnerving feeling that comes from not being able to see the bottom of the Sea. The world becomes so impossibly big when you can’t see the boundaries around you. Anything might be in those depths, the space in front of you which you can’t see. It’s what makes the dark basement scary – the idea of more space than we can see. Here there is nothing to hear but the faint hum of the boats and the calls of the other swimmers. I like being made to feel small in the world. It’s comforting, in its way, to feel unimportant. It releases tension. It takes some of the pressure off to be in charge and in control. The morning winds down, as it must. I could have stayed all day, but there are other tours and the waters are getting crowded. We head back to the island, stopping on North Beach for fruit and beer. Then back to the dive shop for a lunch of red snapper, ceviche, and guacamole. It’s been an incredible day. I’ve been writing a lot already – I’ll pick up more tomorrow. 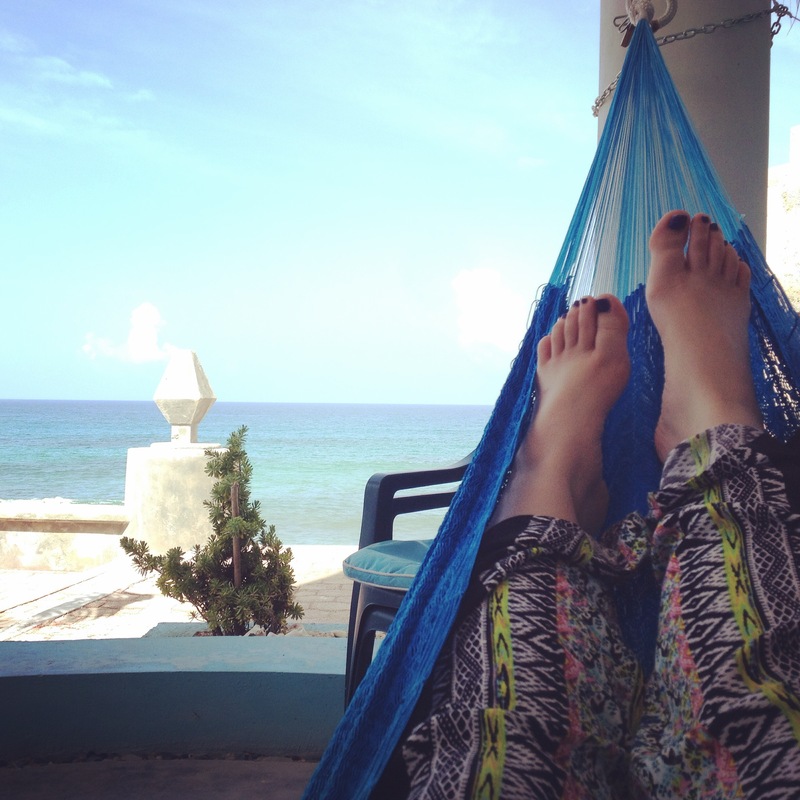 In the meantime, the hammock is calling. 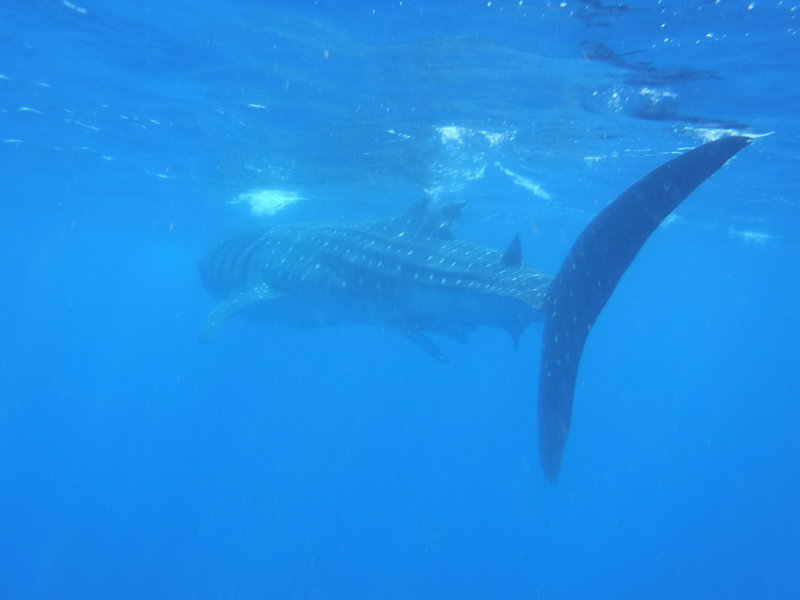 This Post was posted in Anecdotes, Places, Travel and tagged Bucket List, Isla Mujeres, Mexico, Mexico travel, ocean, Sightseeing, Spiritual moment, swimming, Tourism, Transcendance, Travel, Whale Sharks. Bookmark the permalink.